On 30th October BULPROS opened its doors to high-school students and welcomed them to its Software Development team as part of the program “Manager for a Day”. The initiative aims to provide career guidance to young talents and is one of the most recognizable events of its kind in Bulgaria, with over 15 years of history. 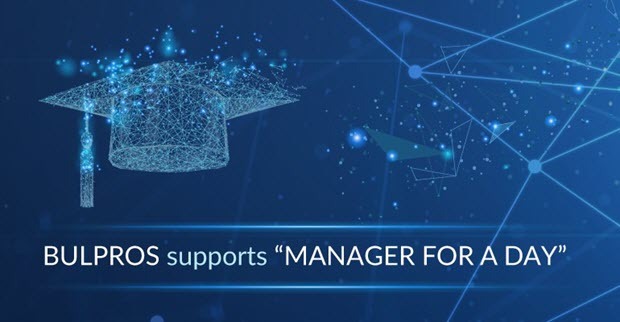 Staying true to its mission of supporting the educational system and growing the next generation of IT talents, BULPROS has been taking part in this initiative for several consecutive years. BULPROS team believes that the business needs to support the education and as one of the fastest growing technology companies, we are committed to the development and education of the young IT talents in Bulgaria. That is why we regularly support and participate in worthwhile initiatives such as “Manager for a Day”, the first Bulgarian High School of Computer Programming and Innovation in Burgas and many others. “Manager for a Day” is an initiative, organized byJunior Achievement Bulgaria and aimed to provide career guidance and orientation to young students between the ages of 16-23. The first “Manager for a Day” took place more than 15 years ago and since then, every year the initiative raises great interest among companies, government and non-government organizations. “One Day Manager” is fully aligned with the educational policies and initiative of the European Union. This year’s edition of “Manager for a Day” took place on October 30.